"The most ancient of the buildings, of which the remains are still extant, is indubitably the Chapel of Oran, situated in the burial-place of Oran. Oran was one of the followers of Columba, and the first, it is said, who was interred in Iona; hence this burial-ground has ever retained his name. 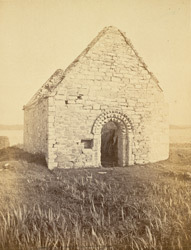 The chapel, which is only sixty feet in length by twenty-two in breadth, is built principally of red granite; it is now unroofed, but is otherwise entire. Its architecture is rude, and is probably to be referred to the twelfth century. It is lighted by two very small lancet windows in the sides, looking north and south. The doorway is the only part on which any attempts at ornament have been made, with the exception of a very handsome triple arch, within the chapel, forming a canopy over a tomb. This arch, however, forms no part of the original chapel; it has evidently been built at a later period, a portion of the wall having been removed for this purpose. The interior abounds with numerous stones and monuments with inscriptions and figures..."